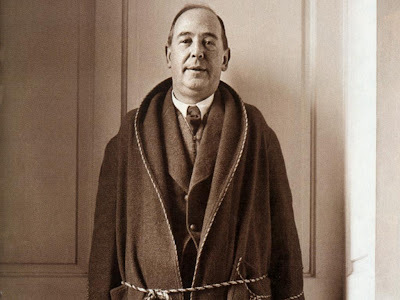 "Some Saturday C. S. Lewis" was introduced and explained here. It's been awhile since I've put up a Lewis post. There is a good reason for this: I am lazy and disorganized. Your forgiveness will not go unappreciated. In any case, while I try to get back on the wagon, here is a well-known section from Mere Christianity, Book IV, Chapter 8. I'm not totally convinced of his use of "Be perfect", but his point still stands, doesn't it? The real problem of the Christian life comes where people do not usually look for it. It comes the very moment you wake up each morning. All your wishes and hopes for the day rush at you like wild animals. And the first job each morning consists simply in shoving them all back; in listening to that other voice, taking that other point of view, letting that other larger, stronger, quieter life come flowing in. And so on, all day. Standing back from all your natural fussing and frettings; coming in out of the wind. In the same way the Church exists for nothing else but to draw men into Christ, to make them little Christs. If they are not doing that, all the cathedrals, clergy, missions, sermons, even the Bible itself, are simply a waste of time. God became Man for no other purpose. It is even doubtful, you know, whether the whole universe was created for any other purpose.